Yes, today is the day we launch the new portion of our site dedicated to showing our long promised system for building dwellings from shipping containers. Its been a long multi-year journey, much of it documented right here on the blog. Its worthwhile now going back and reviewing where this began. I think my path to this point is informative, and most importantly speaks to how carefully considered this system is. We invite you to click through to read the rest of the history of this journey. But first may we present ibu_revolution. Like much else around here my first interest in the application of shipping containers to building shelter began on the original Dwell message-boards. Prefab was heating up thanks to Dwell magazines competition to design a prefab house, and notably one of the entries by architect Wes Jones featured containers, something he had been advocating for some time. A new site fabprefab.com was launched to track all this activity. Fabprefab included a section on shipping container homes which began the path to legitimizing it as a building technique. Fabprefab included a message-board where there was much discussion about just how you would go about building a home out of these things. When one day in the Fall of 2004, lo and behold, a fellow David Cross appears on the message boards and says Wow, its really great that you are all so interested in building a house with containers, and oh by the way here are some pictures of the container house that we are right in the middle of building in Charleston. Well we were all floored. David and I spoke a lot over the next few months and I tried to absorb as much as I could from him. He was an ex-merchant marine who had been working with inter-modal shipping containers for many years. His company was folded into a larger outfit who among other things were creating custom modified command centers and field offices from containers. David was interested in expanding it into housing and the Charleston house was their first proof of concept. I made plans to go visit their factory and see what it was all about. Around this time David and I had a discussion about the difficulties in convincing building officials of the merits of building with containers. David advanced the idea that a "shipping container" as a term was too loaded with preconceptions. He proposed that this was a form of modular construction using Inter-modal Steel Building Units, or ISBUs, or IBUs as I call them. We were not building with shipping containers. We were building with ISBUs. That was it - the term was coined by David, I wrote about it in the blog in March 05. Since then the term ISBU has take firm hold of the concept and you can see it being used all over the internet. Just Google it - here, let me get that for you. Thats right. 2005 - First time ISBU on the internet - right here where you are reading now. Fast forward to Today - ISBU in use everywhere, including by every greazy dealer that would like to convince you they know what this is all about. Thats how you can tell its sunk in! So I went down to Tampa and visited the factory, got a full tour of the anatomy of an ISO box, I saw a mysterious command center being fabbed, and had my fingers protected from white hot metal by a mysterious insulation. I came away with the seeds planted. I had an understanding of how the boxes were built, what was good about them, what was their weaknesses, and I had begun to formulate my ideas about what was the best way to use them to make houses. A sketch that was posted along with my IBU essay in 2004 shows the first iteration of the house design you will be seeing today. Three 20ft boxes gathered around to form a large open space. This space to serve as the common areas of the typical home program, and the containers to form the other functions that can tolerate their limited dimensions. Shortly after this I posted a cartoon about a container home being built in a traditional neighborhood. In this cartoon I used one of my design sketches of a two story house based on modular units at the perimeter and a resultant space between them roofed with a pre-engineered building system. My first design study was to create a small dwelling within a single 40ft unit. I saw as a small cabin, and as an IBU from which larger multi unit dwellings could be built. In 2005 I created the schematic model, and later that year designed two sketch proposals for a multi-unit in-fill building for a site in Los Angeles. They had a revision of their zoning code to promote multi family densities in existing neighborhoods in order to create more housing in the city. One of the schemes used the single 40ft module design. The other used a stack of two module layouts that followed the units on the perimeter+large space in the center model, again with a pre-engineered roof system. There was a little bit of a lull in my activity in 06 but during this time David Cross helped found and joined a new company whose sole mission was to build with shipping containers - SG Blocks. Here they pulled together all of the experts who had worked on their projects to date, now ready to advance the practice. I did not advance the concept again until the end of 2006 when I was approached by a friend Jeff Rous to enter a competition for student housing. It seemed like a perfect application for IBUs and we came in a respectable second place. In the course of preparing the competition entry I was able to work through much of the concept for how the single module units would combine into larger multi unit buildings. At the root the single module multi unit buildings come together in the same way as the multi module dwellings. 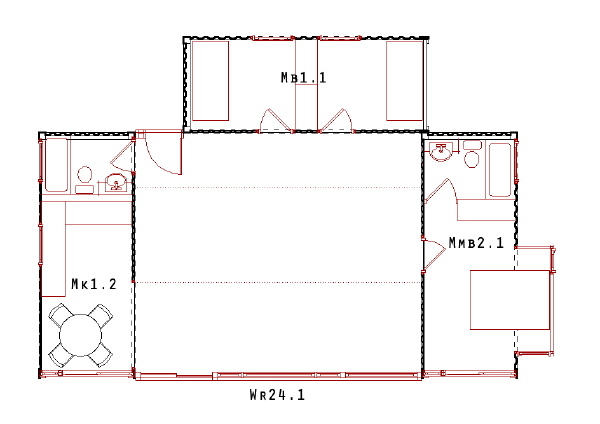 In the case of of an apartment building the occupants have shared common space between their units, just as in a multi module home the family would have shared living space between the modules. I worked my way through much of the concept work including various accessory pieces that would join to the IBUs to add functions. The competition was completed in the winter of 2007 and following it I continued to work on the logic of the system. That summer I presented a brief outline of how the system would work in total. The first part was the spacial problem as I've described above - making positive quality space for a dwelling. The second part was a discipline for modifying the containers into modular units. I'd envisioned limiting the set of alterations that had to be made to a small set of door and window openings. This would reduce the amount of engineering required and make the manufacturing more routine. Next I needed to use the opening designs to create again a limited set of container modifications that supported several different interior fit-outs. In this way a limited stock of modified boxes could be used to create a range of floor plan solutions. An outline of this very system was presented on the blog in July of 07 two years ago. The sample floor plan published harkens directly back to the first sketch posted with my ISBU essay from 2005. Forward a year to 2008 I was engaged by artist John Unger to design a home and studio using shipping containers. John brought a competent concept to the table which while not congruent with my system shared enough characteristics to serve as a test bed and a platform for working through numerous details. Together we discovered many solutions such as utilizing industrial mezzanine structures, and hanger lift doors, and some things such as the corrugated steel arch roof which have been incorporated as options for the system. Currently it appears the multi story scheme will morph into a single story scheme and in that process I'm sure we will discover more applicable to the system. Its been a very useful process and as near to prototyping the system as I could hope. Which brings us to the present. I've finally had the opportunity to model and briefly document the expansive possibilities that this system brings to building with IBUs. I've extensively documented the range of variations for a simple house design. More designs remain to be elaborated, but this sample reveals the great range of more to come. Music would help- find a guy with an old synth. I wonder about the sound in these steel lined rooms? Love the 2-module unit as a remote weekend place with walls of windows on both sides of the center space - any ideas on approximate cost? Joe, at this point you can assume the costs will be comparable to conventional construction. Thanks for all that you write above. One of the unsung heroes in a lot of the structures that have gone up is PE Steve Armstrong, now the COO of SG Blocks. True David - I am remiss in not mentioning him. I've worked with Steve on the Unger Studio project and he brings great knowledge of the container structure to the table. Most of what I know has come through him, and yourself. Congrats on the new site and IBU concept. The intro video is amazing. One question that maybe you've answered previously - How are you proposing to insulate these babies? Glad you enjoyed it Chad. Still a shame I could not work out the permission for the music track on the video - really gave it some punch. Perhaps you could set me up with the guys that did the music for your video series? Insulation - the big question. We plan on using the insulating radiant barrier paint. SG Blocks has field proven this in hot climates. Cold climates, not so much - until we have reliable test data to fall back on cold climates will have to rely on conventional insulation - at the exterior is my preference. Um, Greg, I finally got to look at the video (I do most of my browsing on the iPhone now). Really amazing work. Please keep us posted on any developments. glad you liked that Mark. You should sign up for the mailing list, and/or the inquiry form depending on your interest.